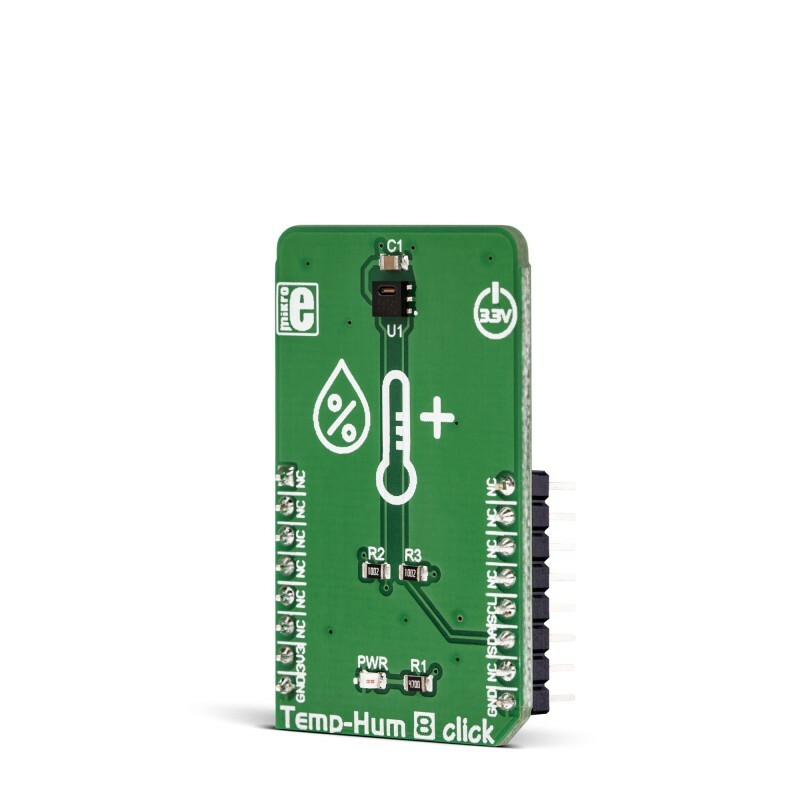 Temp&Hum 8 click is based on a sensor from the popular SHT family, designed to measure temperature and humidity. This sensor family has already become an industry standard, providing proven reliability and stability while requiring a minimum number of components, making the development of applications cheaper and faster. The sensor used on this click is labeled as SHT21, which features a high degree of measurement linearity, thanks to the factory calibration and testing which is performed for each sensor sample. Featuring high accuracy, good linearity, proven reliability, and long-term stability, you can use this sensor can for many different applications. Some of them include weather stations, various environmental data collection applications, IoT based applications, and all applications that require a reliable thermal and humidity readings over longer periods of time. 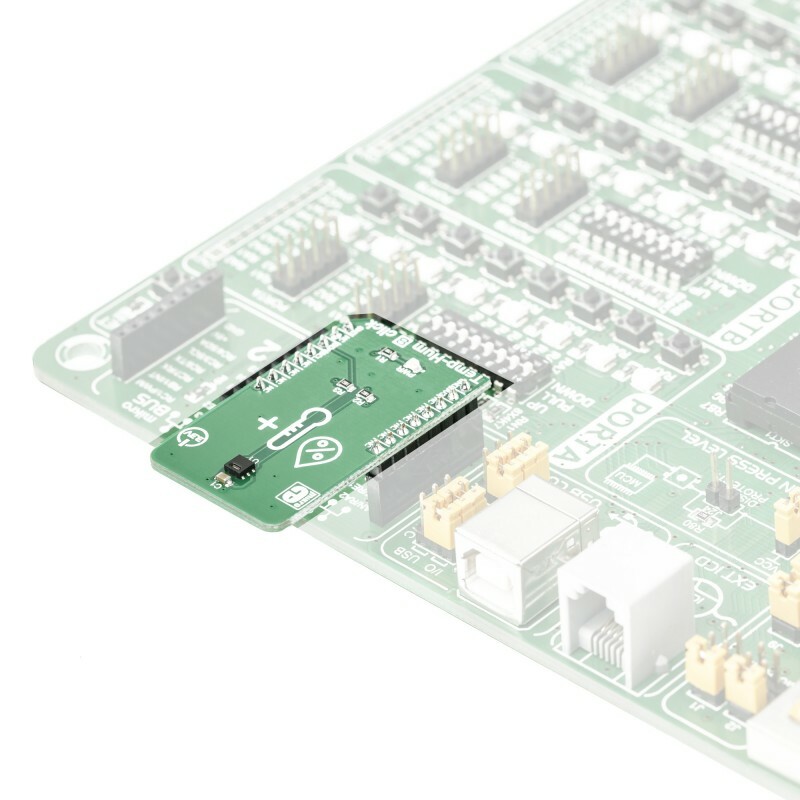 The programmable sensor resolution allows you to select between 8/12 bits and 12/14 bits (temp/hum), which directly affects the power consumption. The sensor housing is made of epoxy with no Pb, Cd, or Hg parts, which guarantees the reliability and compatibility of Temp&Hum 8 click with RoHS and WEEE standards. 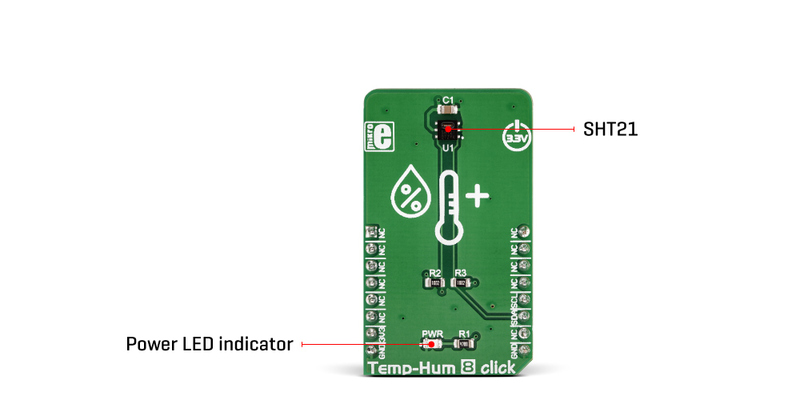 The sensor IC used on the Temp&Hum 8 click is the SHT21, a Humidity and Temperature Digital Sensor from Sensirion. This sensor is factory calibrated, allowing down to ±2% relative humidity tolerance (RH) and ±0.3°C thermal tolerance. However, the RH measurement of the sensor is affected by the temperature, therefore it is required to use the sensor at the temperature of the air, in which the humidity is measured. The humidity accuracy is also affected by the RH percentage: if both temperature and humidity are placed on a graph, it is possible to get a diagram of the RH accuracy as the function of RH percentage and temperature. One such diagram is presented in the datasheet of the SHT21 sensor, which can be found in the Downloads section, below. The SHT21 IC is based on the CMOSens® technology, featuring the capacitive RH sensor and the bandgap temperature sensor. Besides the sensing elements, the IC incorporates an analog front end (AFE), which consists of A/D converter, OTP memory, and a logic section. The integrated A/D converter can be programmatically selected from the lowest 8/12-bit resolution, up to resolutions of 12/14 bits. The resolution selection affects the power consumption, as well as the data output rate. The response time might vary between 3ms for 8-bit resolution, up to 29ms for 14-bit resolution, for the RH readings. The resolution selection can be set within the so-called User register. 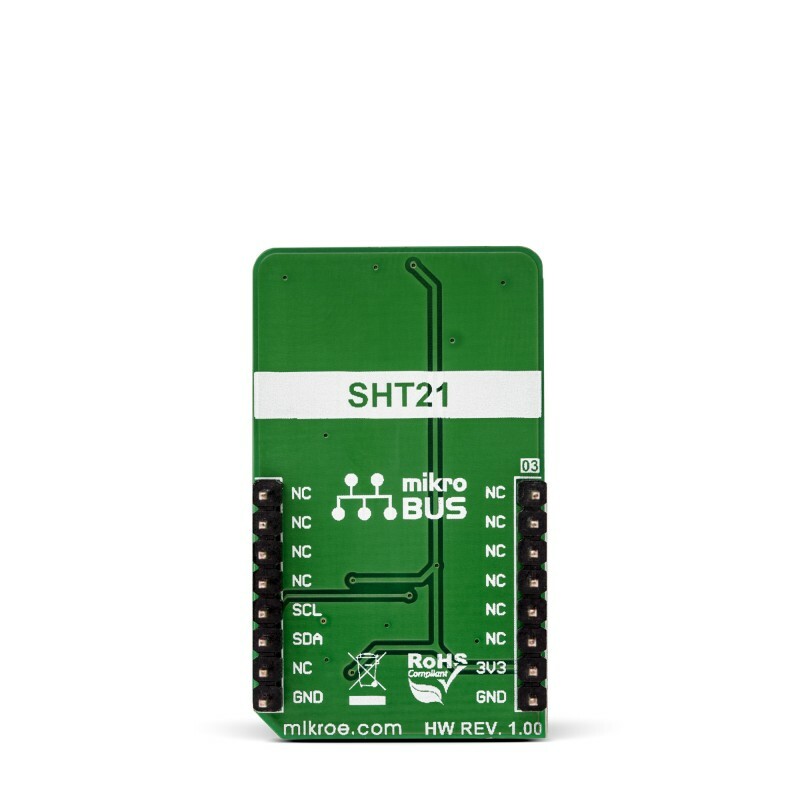 The SHT21 sensor also features an integrated heating element, used to evaporate condensation. The heating element can be simply activated by setting a bit in the User register. In the case when the heater is powered on, the power consumption might rise above the typical values. The SHT21 sensor is also equipped with the brown-out status bit, located in the User register. This bit indicates the low power voltage: if the voltage drops below 2.25V, this bit will be set to 1, indicating a brown-out condition. 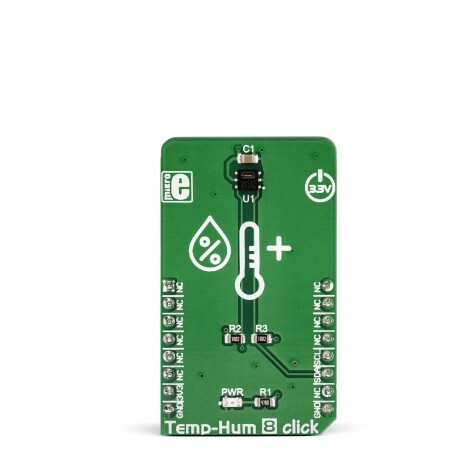 Temp&Hum 8 click uses the I2C interface, and it already features pull-up resistors on the I2C lines. It can be used out of the box. The provided click board™ library contains simple and easy to use functions, which simplify configuring and reading of the measurement data. These functions are demonstrated in the included example application and can be used as a reference for custom projects. These functions can be used in mikroC, mikroBASIC and mikroPASCAL compilers for all MCU architectures supported by MikroElektronika. Key Features High accuracy, good linearity, proven reliability, long-term stability, programmable resolution from 8 bits, up to 14 bits, an integrated heater, etc. This table shows how the pinout on Temp&Hum 8 Click corresponds to the pinout on the mikroBUS™ socket (the latter shown in the two middle columns). We provide a library for the Temp&Hum 8 click on our LibStock page, as well as a demo application (example), developed using MikroElektronika compilers. The demo can run on all the main MikroElektronika development boards. The library initializes and defines the I2C bus driver and drivers that offer a choice for writing data in the register and reads data from the register. The library includes the function for reading Temperature and Relative Humidity data and function for reading/writing data to user register. The user also has the function for default configuration device for measurement and function for device software reset. Application Task - (code snippet) - Reads Temperature and Humidity data and this data logs to USBUART every 1sec.